Use sharp, proper tools. 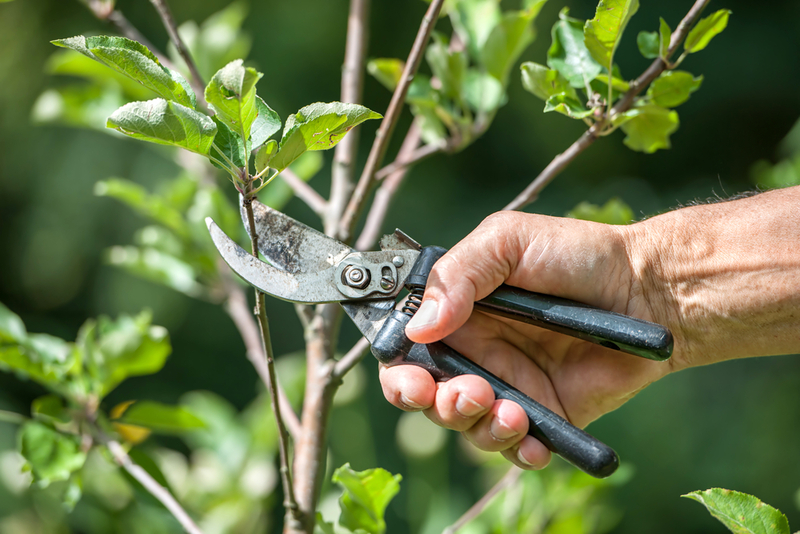 To avoid damaging or tearing the branches from your tree or shrub, always make sure to use the right tool for the branch. For example, hedge shears are no more appropriate for a tree branch than a handsaw is for a delicate shrub. Keep your tools sharpened – you want clean cuts. In general, use rope saws for high tree limbs, pole pruners and loppers and folding pruners for easy to reach limbs. Disinfecting tools with 1 part bleach to 9 parts water after use helps prevent the spread of tree diseases. Cut correctly in the right place. Tree branches grow from stems at nodes. Pruning always takes place on the branch side of a stem-branch node. To avoid harming your tree or shrub, always make sure you find the branch or stem collar – a bulge at the base of the branch. Next, find the branch ridge, the raised section where the branch and the tree trunk are joined. All pruning cuts should be made on the branch side of this collar. Cut as close as you can without cutting through this ridge or you might create a wound that won’t heal properly. Prune at the right time of year. Trimming your trees or shrubs in late summer or early autumn may put stress your plant or put it at risk for fungal disease. It can also stimulate new growth, which has little time to harden before cold weather comes. Pruning at this time may also produce weak, spindly branches, unable to withstand winter’s chill. The best time to prune is during a plants’ dormant season, generally late fall or winter. Pruning during the dormant period minimizes sap loss and subsequent stress to the tree or shrub. Use safe pruning practices. Make sure your branches won’t fall on power lines, causing outages or electrocution. If using a ladder, make sure its secured to the tree. Don’t trim your trees in icy, windy weather – you’ll only increase your risk of falling. Minimal pruning is best. When deciding how much to prune, a general recommendation is to trim as little as possible. Any pruning can stress a tree or shrub. Never prune more than 25% of the crown and make sure that living branches compose at least 2/3 of the height or the tree. Planning a Wedding? Re-do your Yard for a Total Wow Venue!